The peace order was filed a day after Miner sent an inquiry to Harshman asking for comment on several issues for an upcoming article. The email is reproduced below. 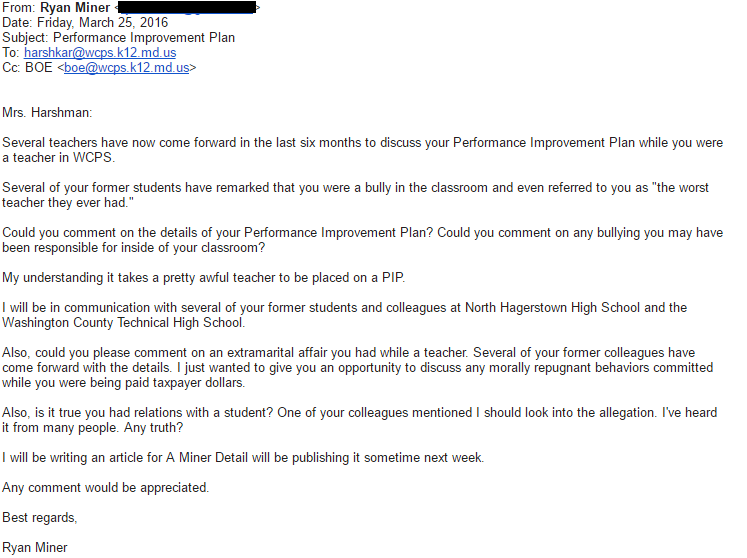 This is not the first email which Miner has sent Harshman requesting comment for an article. According to Miner, Harshman has never responded to his requests for comment, and has never asked him to cease sending inquiries. Since Miner has not used any threatening language against Harshman, what could the peace order be for? Could a blogger emailing questions to an elected public official be considered harassment? "A course of conduct directed at a specific person that causes substantial emotional distress in such person and serves no legitimate purpose" or "Words, gestures, and actions which tend to annoy, alarm and abuse (verbally) another person." This is of course a very broad definition, which state and federal legislation and common law have narrowed and refined in various ways. However, for our purposes, WHOA defines online harassment as any actions that meet the qualifications of the above definition after the harasser has been told to cease. 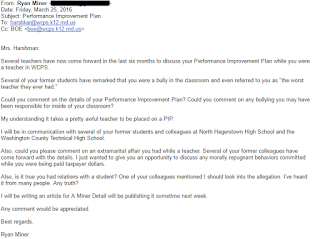 Since Harshman has not asked Miner to cease, this would not meet the WHO@ definition of online harassment. However, there is a deeper issue at stake here. Harshman, as an elected official, has a duty to remain accountable to the voters, and in turn, the press. The 14th amendment of the Constitution of the United States extends constitutional citizenship rights and equal protection to apply to state and local governments, in addition to the Federal government. Furthermore, under U.S. court rulings, bloggers are protected the same as journalists under the 1st amendment. Of course, even journalists are not protected from liability for intrusive or harassing newsgathering activities. However, as far as we can tell, Miner's conduct has not been harassing or intrusive, especially if WHO@ guidelines are followed. The question then remains, is Harshman's peace order an attempt to suppress Miner's 1st amendment rights as a journalist? 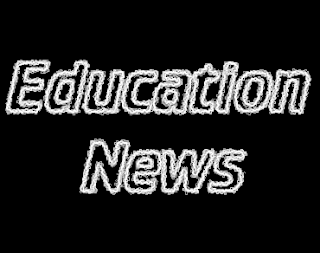 Miner frequently emails the Board of Education on issues prior to releasing articles, and all Board members receive emails addressed to a shared email address. Would such a peace order be feasible, since Harshman is an elected official? Unfortunately, as I am not an attorney, I am unable to answer these questions, but I suspect that the answer would be no, such a peace order would not be feasible or hold merit. When reached for comment, Donna Brightman, president of the Board of Education, responded that Harshman's actions were not authorized or supported by the Board of Education. Karen Harshman did not immediately provide comment, but the WashCo Chronicle will gladly publish any response when it is received. In 2014 a blogger, George Chidi, fought and won a similar restraining order in Georgia.